Don’t forget to enter the eBrush Giveaway at the end of this post! Have you seen Craftwell’s eBrush before? It helps you get airbrush effects from your markers. So cool! I used it to turn a plain office supply store manila tag into the customized tag you see below. This tag is what I created after trying the eBrush for the first time. I can only imagine what I’ll come up with as I continue to use it! 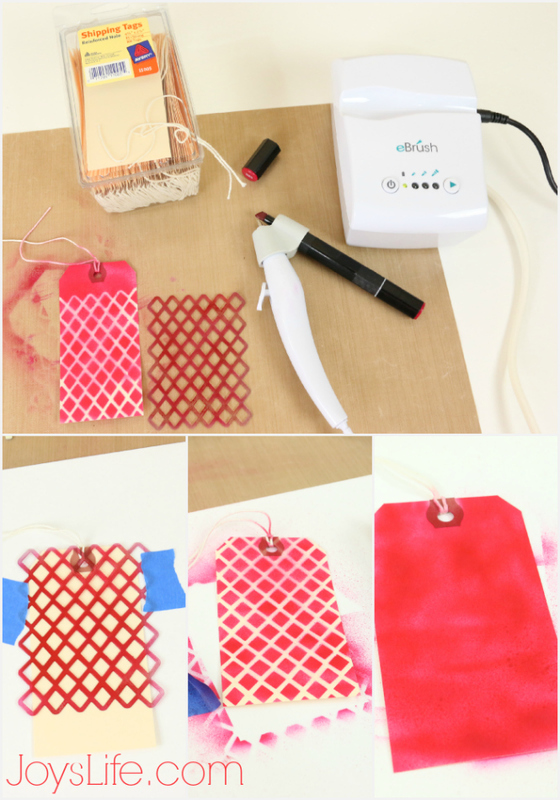 I used a lattice stencil and sprayed over it with a red marker that was included with the eBrush. I made a few of these tags so I could add them to Christmas gifts. 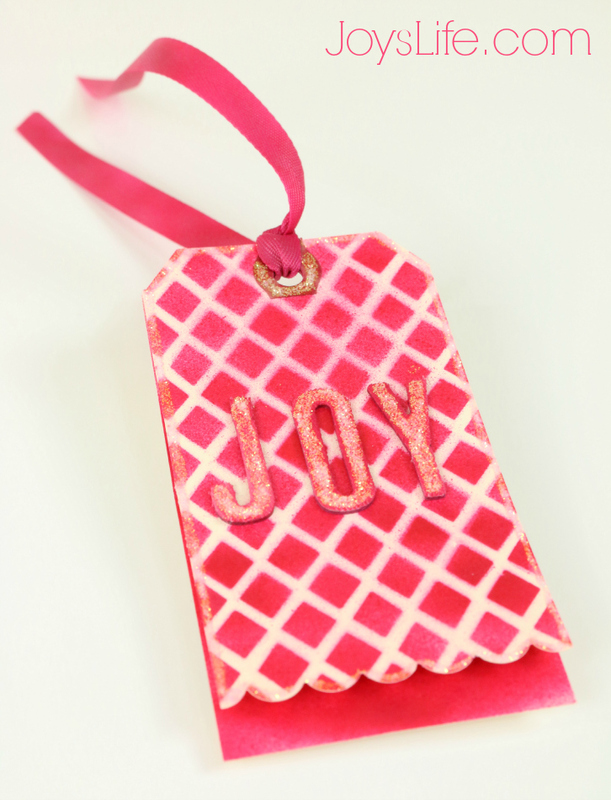 I used a lattice covered one and solid colored one to create the tag shown in this post. I think it’s so cool that these used to be plain manila tags! Just a little airbrushing changes them completely. Just think of all the ways you can use the eBrush! Here I used it to color white fabric letters so that they match the tag. Next, I colored white ribbon to perfectly match too. Why be stuck with plain white embellishments? Make them the color or colors you need! Leave me a comment telling me what you would make with the eBrush! Don’t forget to enter the giveaway below too! I am a Brand Ambassador for Craftwell and received an eBrush for creative purposes. I would totally make awesome watercolored cards! Would love to give this a spin. If I'm lucky to win this, it wil be a nice gift and I will be making alot of nice watercolor cards. I would decorate album pages with the eBrush. I am just realizing that crafts can be very intricate but easy to do. I just purchased a cameo and this can add detail to my designs. Also, learning a lot from the website.....Thanks! What a cool little tool!!! I would use it to make cards and also use it on my scrapbook pages for that extra "wow"!! Merry Christmas! I am thinking of all of the amazing things I would be able to do with this prize! Thanks for the chance to spark my creativity to higher levels! How fun...I'd make card, tags, backgrounds...everything! I wish I had it right now to add the finishing touches to some salt dough ornaments. I can definitely see how it would make cardmaking easier...???? How awesome! I would spray everything that's not nailed down! Lol. Totally would use this for scrapbook embellishments. Thx, Joy! Would be so awesome to win this!! I would love to make backgrounds for the cards I make. 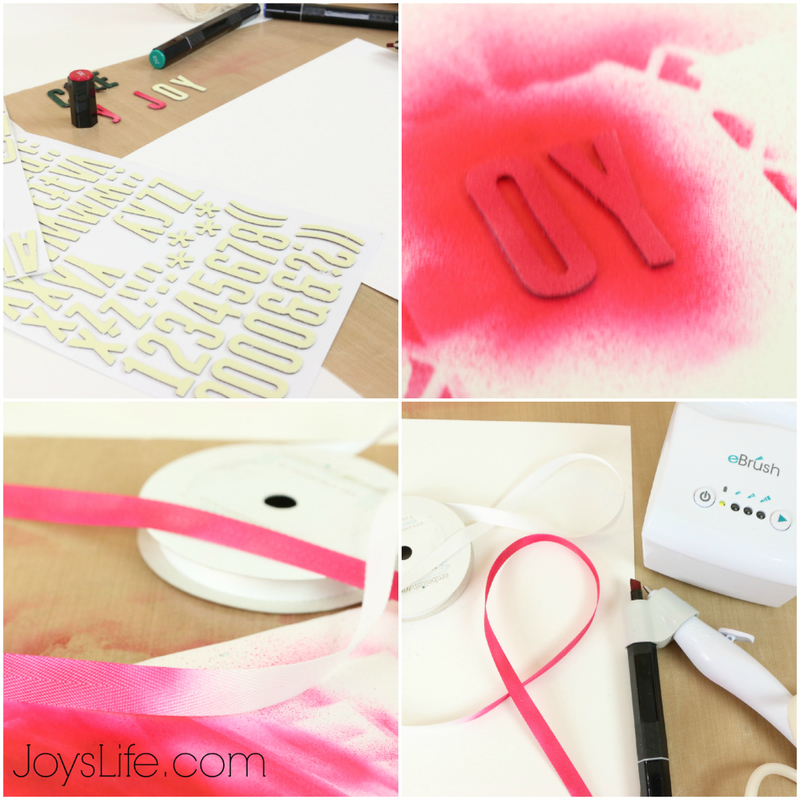 Cards were the first thing that comes to mind or backgrounds for vinyl stenciling on canvas, but there seems to be a wealth of potential for this tool. I would use this for so many things! I think my first project would be the scrapbooks I am working on for my children (all grown) from our Family Vacation in August to Disneyworld. That's what they are getting for Christmas.